Young fit couple in gym resting, drinking water. Fitness woman drinking water from bottle. Muscular young female at gym taking a break from workout. Young athletic woman drinking water in gym after hard workout . 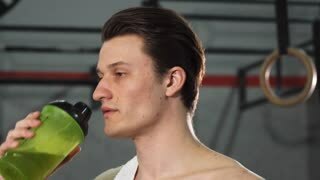 Close up portrait of a young attractive fitness man drinking water after exercisig at the gym smiling to the camera joyfully resting after training. Workout, hydration, healthy lifestyle concept.